How’s everyone doing on their shopping so far this year? Are you ahead because Black Friday and Cyber Monday came early? Or have you not started yet because this year’s calendar—with Christmas falling on a Tuesday—is tricking you into thinking there’s more time than there really is? If you’re a writer, this might help you give suggestions to family or friends. Or you can direct your family to this post for ideas. 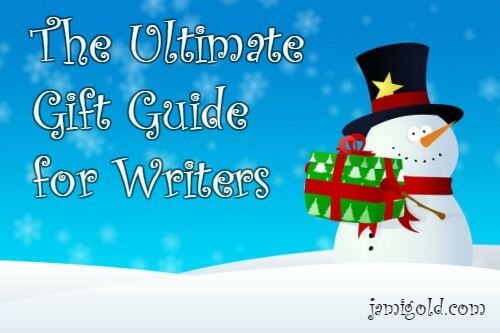 Something on this list is bound to please every writer out there. Adjustable laptop table for typing wherever we find ourselves—in bed, lying down, our favorite chair, etc. What did I miss? What other writing craft or publishing-related books do you recommend? Do you have suggestions for other items to add to the list? Which things would you most like to receive? Is there anything on the list you wouldn’t want? Will you brave the store crowds this year? Do You Struggle with the Learning Curve? I saw some games at Booksamillion the other day that were book themed. Love the list, Jami–now that I’ve spent way too long checking out mugs and pillows on Amazon! Love these! All my people may or may not be getting the swear word coloring book ;). And if Santa wanted to put a treadmill desk under the tree, I’d sure be grateful. Woah the arthritis compression gloves sound interesting. I never knew such a product existed! 🙂 Also, wow treadmill/ elliptical at your desk!! !